The Z-scan technique is a simple and popular experimental technique to measure intensity dependent non linear susceptibilities of materials. 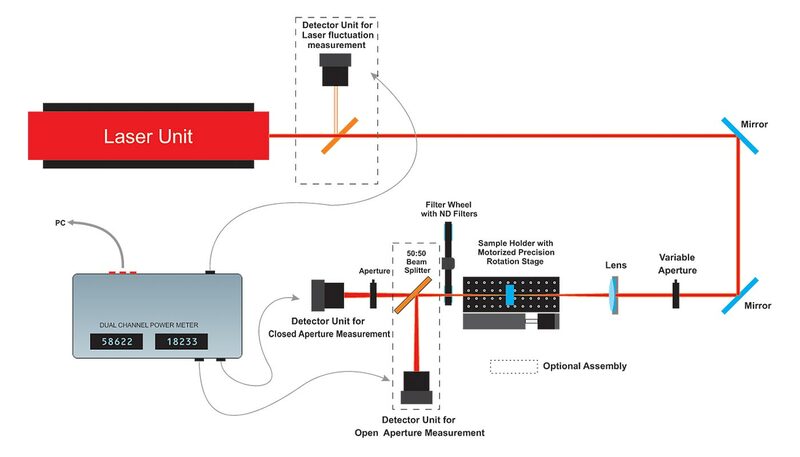 The Z-SCAN Characterization Kit is a simple implementation of the z-scan technique that can be used to characterize optical materials. In this method, the sample is translated in the Z direction along the axis of a focused Gaussian beam and the far field intensity is measured as a function of sample position. Analysis of the intensity versus sample position Z-scan curve, predicated on a local response, gives the real and imaginary parts of the third order susceptibility. Standard open aperture and closed aperture z-scan are covered with the kit. The two measurable quantities connected with the z-scan are nonlinear absorption (NLA) and nonlinear refraction (NLR). These parameters are associated with the imaginary and real part of the third order nonlinear susceptibility, and provide important information about the properties of the material. 1. Optical breadboard 1200 x 800 mm and rigid support for above optical breadboard - 1no. 3. 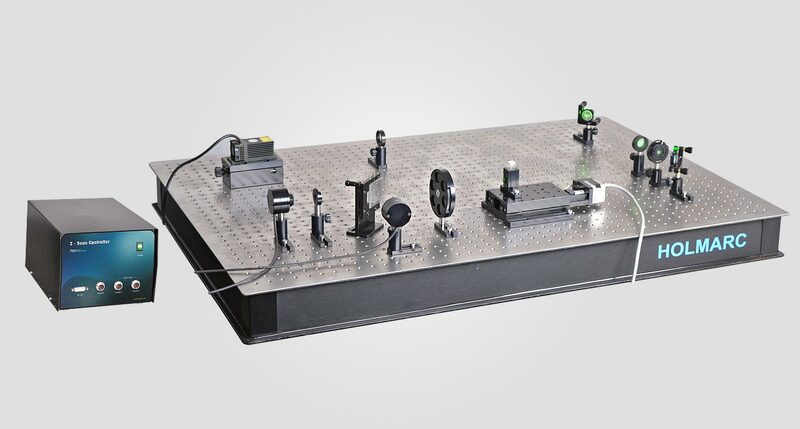 Sample holder with motorized precision linear stage and control electronics - 1no. 4. Variable beam splitter with mount - 1no. 5. Kinematic mirror mount with metallic mirror - 2nos. 6. Aperture wheel with selectable apertures of different sizes - 1no. 7. Lens set (2) with post and post holder - 1no. 8. Filter wheel unit with 5 various neutral density filters - 1no. 9. Variable aperture with mount - 2nos.